Bulova 1964 Date King "U"
Dial - smooth aged white or champagne, hands are lance type, even hours are Arabic, back is ink stamped "soh"
I will post better photos after I finish overhauling it. I would like to know what the replacement crystal for this would be. 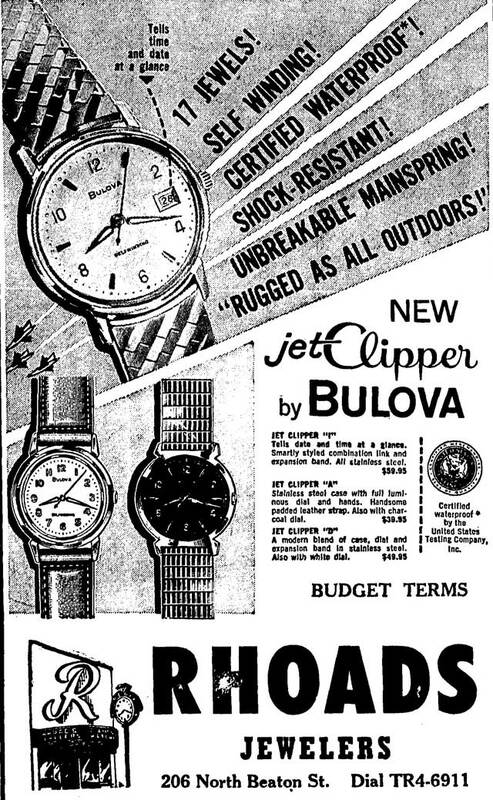 I would say 1964 Bulova Jet Clipper "I"
The watch being from 1964 is likely from the Date King line. The Jet Clipper 'I' and the Date King 'U' both share the same model reference number (11284), according to our pricelists. I find ads for the Jet Clipper through 1963, then the Date King model shows up in 1964 ads. Thank you jabs and Andersok! Aother one that morphs to a new model name, I'm in agreement with Ken. 1964 Bulova Date King "U"
Agreed, this one falls after the name change by date. Thank you all for your experience and research. New crystal, new hands and is runing well. But I'd like to get a thinner crown for it.